What we now know as Lawrence County was settled by the Scottish-Irish and Germans. They came to the area early, some before the American Revolution. They cleared the land and built shelter. The Scottish were fiercely independent and if their independence was threatened, they moved further west. The first settlers were usually single men, or men who came with a group to plot the land and build shelter before returning East for their wives. As their families arrived better homes were built and as the community grew, they built churches and schools. The main reading material in the home and the schools was the Bible. The children learned to read,write, and do sums (math). Discipline was harsh. School was short at first, three months each year, as the children were needed to work the land and help support the family. The first teachers were paid by the families of the children. If they did not live close by, they boarded with some of the families. While we do not know when the first school was established in the county, it is known that there was a log school house near Harlansburg in 1800 or 1801. The first school buildings were one room and they had a log fireplace for heat. Oiled paper gave light through the windows. The older boys helped with the firewood. Restroom facilities were outside. Paper was scarce so the students used hornbooks. A hornbook was made of wood and was shaped like a paddle. Paper was attached to the hornbook. Printed on the paper were numbers, the alphabet and Bible verses. A thin piece of clear horn stretched over the paper to protect it. Drinking water was pumped from a well into a common water bucket and each child drank from a common dipper. Lunches would be carried from home and usually consisted of cornbread, fruit in season, and homemade cookies or cake. When the first public school act passed in the Commonwealth of Pennsylvania in 1834, it was to insure that every child would be able to attend school and get the basics of a good education. The schools would be paid for through local taxes and state appropriations. Lawrence County in 1862 levied $23,646 in taxes and received $2,184 from the state. The cost of teaching 6,910 students averaged 52 cents per month per student. The teachers did not have to have the education they have now. They would complete grammar school and go to what was called a “select school”. They were then qualified to teach. Teachers earned an average monthly salary of $27.45 for men and $17.84 for women. In 1841, the Commonwealth tried to repeal the public school act. Thaddeus Stevens, an aggressive, uncompromising member of the Pennsylvania legislature led the fight to defeat the bill. As the community grew, schools were built in every area. 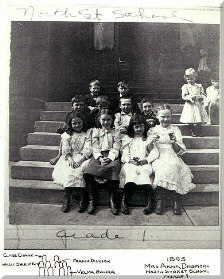 By 1858 New Castle had two large school buildings. One on North Jefferson Street and one on Pearson Street. In 1875 after what the New Castle News called a somewhat stormy session, the school directors of the First and Second wards of the city established a high school on the second floor of the Knox building on South Mill (known as the Warner Theatre). It had 18 students and one teacher.